Do we need to review the fact that vegetables are good for us? I think not. The only people who might argue that we should cut down on vegetables are the Meatatarians and the Breatharians. And do we really care what they think? The problem is, while there are some people who love vegetables, most of us have more ambivalent feelings. We don't tend to crave them the same way we do cookies. And there may even be some vegetables we loathe so much that if we accidentally eat them, we might spit them out into our napkins when no one is looking. (Hello, celery? I'm talking to you). On the other hand, there are times, depending on the vegetable and the preparation, when we don't even notice we're eating vegetables. Or, even better--sometimes they actually taste pretty darn good! But for many of us, the number of servings of vegetables we should be eating a day adds up to way more vegetables than we can pretend to enjoy. Those darn nutritionists keep upping the recommended amount--I've actually seen experts who say nine to eleven servings a day. And holy crap, eleven is a big number when it comes to vegetables! So for those of us who struggle a bit, here are some reminders about how to get more vegetables in without undue suffering. 1. Seek Out Variety. This is harder than it sounds, because there's something a little bit suspicious about unfamiliar vegetables, isn't there? If it was really tasty and good for us, why didn't we grow up eating it? Well, the good news is even as a grown up, you can learn to like new ones if you try them a few times. And having a bigger variety cuts down on the "chore" aspect of making sure you get enough. For example, I didn't grow up with kale, and on first try, I frankly thought it was kind of bitter and yucky. But after a few tries, I actually kind of like it! As it happens, this Blogher post by Kayln has a whole boatload of things you can do with kale. 2. Take Short Cuts. If you can afford to spend a bit more money, there are a lot more convenient options for fresh produce than there used to be. Remember when you couldn't enjoy fresh spinach without spending forever washing the dang grit out of it? Of course if you've got the time, it still makes sense to buy vegetables in their freshest, most natural state. But if you're trying to encourage more healthy side dishes and snacks, and you're pushed for time, take advantage of all those pre-washed, pre-cut or frozen options that you grab when you just can't face all that scrubbing and chopping. 4. Don't Fear the Fat. Sure, it's not a great idea to totally drown every vegetable in butter, cream, mayonnaise, or bacon grease. But cooking with a a healthy fat like olive oil can makes a huge difference in flavor. Plus, many of the nutrients in vegetables need some fat to be best absorbed, so you're actually doing yourself a nutritional favor. And heck, if a little bit of butter can turn an otherwise bleak vegetable into something tasty and comforting? Well, I say that's butter well-spent. Like cheese with your veggies? Check out Melting Mama's cauliflower Mac and Cheese recipe. Haven't tried it yet but it sounds great! 5. Blend Them Beyond Recognition. Regular Cranky Fitness readers know I'm a big fan of the Green Smoothie. Tossing some fresh veggies in a morning smoothie along with fruit and whatever smoothie base you like (milk, yogurt, kefir, fruit juice, protein concoctions, almond milk, etc) is a great sneaky way to get a vegetable in at breakfast. Spinach works especially well, but I've also snuck in bok choy, cauliflower, and asparagus. The trick is not to get too aggressive with the veggies at first, and keep the flavor very much in the background until you get used to it. 6. Dip Them. Use fresh veggies as a conveyance for your favorite healthy dip, like hummus, guacamole, bean dip, or, if you've got some calories to spare, peanut butter! 7. Hide Them. If you've got a favorite guilty convenience food or takeout option, sometimes you can at least redeem the meal somewhat by slipping a lot more veggies into the sauce. I find that while I love Indian food, the ratio of vegetables to sauce at most places is always way too skimpy--so I nuke whatever I've got around and toss it in there--makes for more leftovers too. 8. Take advantage of Farmer's Markets or Grow your Own: Fresh vegetables are sweeter and tastier than those that have been shipped from halfway 'round the world. So if you live somewhere where it's feasible, go for the freshest stuff you can find. 9. Salads Don't Have to be Boring: It's so easy to get into a fixed routine with salads, and before long you may feel like you never want to eat another one again. But it's amazing how changing up your dressing or adding a couple of new ingredients can make a salad something to look forward to again. Try goat cheese, pine nuts, fruit, avocado slices, or other healthy but tasty toppings. A few extra calories may be worth it to make the salad seem like something to look forward to rather to endure like a 20 year prison sentence. So do you get enough veggies? And does anyone have other ideas as to how to get more vegetables into our diets? 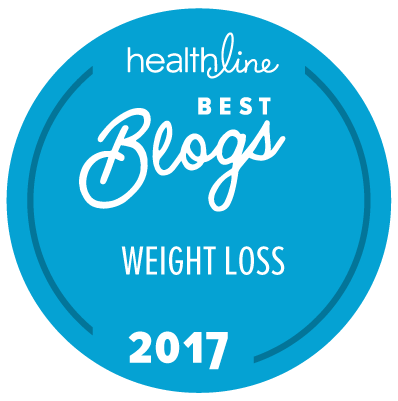 [Note: This post is also scheduled to appear at the Blogher 10X club, where, if you're brave enough, you can join us for healthy challenges in the 10X forum]. All great suggestions!! One more: Put a sign on the table saying: You can't leave the table until you finish your vegetables! I would like to Veto Dr. J's comment (sorry Dr. J). I spent many a long evening as a child, staring at a pile of carrots on my plate long after the rest of the family had finished eating. It did not make me like them. I'm all for experimenting though - make the most of the veggies you do like (surely you can find a few), and for the rest - try different ways of preparing them, include them in other dishes where they are not so noticeable, etc. All great suggestions Crabby! All great ideas. Luckily, my wife and I love veggies and we are helping our 10 month old daughter develop a love for them. Her grandparents are shocked that she likes "that green stuff" (referring to green beans). As soon as I get my hands on a better blender (Ah, cheap Bullet knock-off, you've served me well) I'll be tossing spinach in my smoothies. For now, it's having trouble cutting up frozen strawberries, and a stringy chunk of leaf does not a happy smoothie make. Cranberries are another great salad addition, particularly if you use a vinagery dressing. Yum! Also, I think it's valid to break a few rules to help you love a new vegetable. Fried turnips and cauliflower sounds icky, but I tried it with some bacon, eggs, and cheese in a scramble, and now I add cauliflower to almost anything. Soup? toss some cauliflower in that! Burgers? Why not chop up some cauliflower and hide it in the meat? Rice? (you get the idea). Also, I bought an organic community garden share (my health insurance gives me an "Eat Healthy Bonus" that subsidized the purchase) and I ended up trying a LOT of new veggies because they showed up in there. Did you know celeriac and parsnips are awesome? Toss them in some broth and add some spice and they're fanTAStic. Celeriac, by the way, is one of the ugliest vegetables I've ever seen. It was so ugly it actually LURKED on my counter. 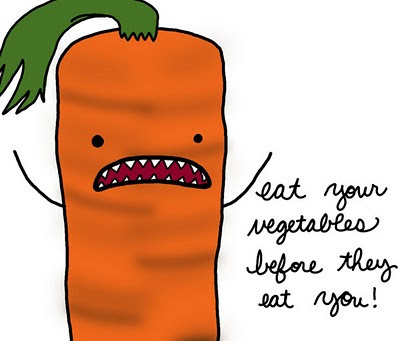 Vegetables should never lurk. We're a vegetable family here - we'll try just about anything. In fact there are days I wonder if my kid eats anything other than vegetables. Another way to get more: grow your own. You'll get a kick out of growing them and finding new ways to use the bounty. And they'll taste way better than what you get at the store. And yes, *everyone* can do it. A pot by a sunny window can grow tomatoes and peppers and herbs. I can not wait for spring to start my garden. 2009 was the first time in over a decade I didn't have a garden (what with the house building and all) and it killed me this winter to actually have to buy vegetables instead of pulling out what I've put up for the winter. Last summer I went to a nutritionist to have her analyze my diet, see what I needed to do to lose more weight. She told me I was eating too many vegetables. And now I'm frightened of celeriac, thanks to TamiJean! I'm with TamiJean about the servings. I try to have veggies at both lunch and dinner but I have no idea how in the world you'd get in more servings than that! I suppose if you were a snacker (I'm not) you could get them in then. Celery is the work of the Devil. My Jack Lalanne power juicer is my favorite appliance. I get loads of servings of veggies every morning in my juice, I even bought asparagus and bok choi for this week's juicing. It is so much easier to incorporate veggies in the rest of the meals of the day knowing that I've already had all the goodness in my juice. I quite like veggies and now I like them more since I discovered how tasty they are when roasted in white wine. Be not afeared of the celeriac, for beneath its gnarled, rooty appearance lies a heart of pure AWESOME. Though, um, as Crabby just posted how much she dislikes celery, she should maybe avoid celeriac. Depends on whether the dislike comes from the texture of celery or the taste. If it's texture, celeriac is more like a potato. If it's taste, that's no good. Celeriac is like celery on steroids. You can smell it being cut over a ridiculous distance. Suh-picy. Give me your celery. I will eat it. I will eat all of it. Also your carrots and spinach and avocados and steamed asparagus with a little garlic butter and your roasted butternut squash with just a teensy bit of honey and cinnamon on top. I'll eat those too. Give them to me if you don't want them. I will make them disappear. If you think you don't like cooked spinach, two words for you: palak paneer. It is so easy to make. Learn. If you are steaming broccoli where I can smell it, be prepared to give it to me. All of it. Just give me the broccoli and nobody gets hurt. But you can keep your stinky cauliflower. And your zucchini. And especially your black-eyed peas. Bleh. Blending spinach into smoothies is about the best way to disguise a vege. I don't mind eating them. And roasted always seems so ultra-trendy and therefore tastier. If I tried to eat eleven servings of vegetables a day, I'm not sure I could eat anything else... Thank you for all the suggestions on how to try new things or get around old prejudices! 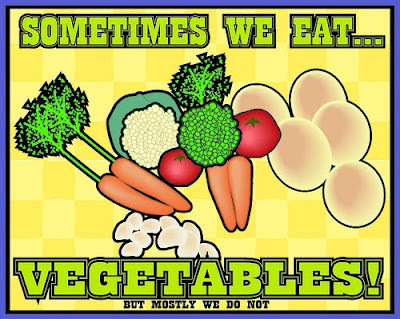 We get a bit of a variety in vegetables, but not a lot. Spinach, broccoli, carrots, onions, celery (in soups only), green beans, peas, tomatoes, cucumbers, sweet potatoes, and beans of all varieties are common in our meals. Mushrooms too, if they can count as a vegetable nutritionally. Other than those, however, we don't get much variety. Every now and then we'll have corn or asparagus, but I know there's much more out there. This will help me experiment a bit. I'm a huge fan of green smoothies too. I can't always get myself to eat all the vegetables I need in a day unless I'm having a vegetable-based soup. It just seems like too much. Tossing some veggies in with milk and a banana and a flavoring helps a lot. It works wonderfully for me, but smoothies that smell like cucumbers and taste like peanut butter and bananas tend to weird my husband out. I love a lot of veggies, and I get most of them in salads. I throw whatever's in the fridge (carrots, tomato, cucumber, broccoli, radishes, peppers, etc) on romaine lettuce and create a jumbo salad. My husband, who I used to have to arm wrestle just to eat a side salad, now gets excited about picking the toppings to go on his. The other way I most enjoy them is roasted. As you pointed out, cooking them that way gives tons of flavor. The one I'll never eat: Onions. Gag. Juicing and leafy veggies in the smoothies are two of my favorites. I cannot eat cooked turnip, mustard, or collard greens ever since they made me sick when I was pregnant. I can have them raw in a smoothie, though. I like vegetables. Even celery. But I still don't think I get enough of them. These are really good suggestions. I love veggies/fruit, but I don't think I eat 11 servings. But dang, it might be fun to try for a week! My biggest get-veggies-in tip is similar to what you said - just nuke some extra frozen veggies and throw them in whatever is for dinner (broccoli and onions go great in spaghetti, peas and carrots in indian food, just about anything in a stir fry). Or if I'm having a wrap, make a gigantic salad that's purposefully too big, and eat the leftovers that can't go in the wrap as a side dish. Good topic! I start all my meal planning by figuring out the vegetables first and then planning the protein and sides around that so the veggies really are the main course. And I'm shocked Dr. J doesn't like brussels sprouts! "undue suffering" made me giggle...I like most veggies but since I don't get in the right amount of servings each day, when I DO eat them I have a huge portion (like broccoli - I'll have at least two cups' worth). I figure it's better than what I used to eat, when my veggies consisted of onion rings and french fries! No joke, I eat so many veggies that BF suggests I take "a break" from them every now and then. He thinks my stomach needs occasional rest from digesting all that roughage, and he prods me to spend a day eating white carbs & cheese. Lol. Hey! Don't forget to try new and strange ones. The NYTimes had a Dining article on rutabagas the other day: something like "the best vegetable you've never tried." I've been a rutabaga fan for a long time, actually. It's great to dice them up in soups instead of potatoes. Much less starch, more color, and more flavor. A little turnipy, but not so bitter. You can also roast it (the Times article had a recipe). I love most veggies.. even Brussels sprouts and I have no problem being convinced to eat them but unless a serving is about 1/4 to 1/3 cup, and they're consumed in two or three sittings, 11 servings seems ridiculously high. I would eat dirt before touching cauliflower or brussels sprouts - but that's just me. Love the rest of the suggestions, though. I just don't get enough veggies. Love these ideas. I could eat roasted butternut squash until I was sick, as long as somebody else does the tricky preparation bit for me. Why are some of the tastiest veggies the hardest to cut? Eleven servings???? (Yes, my head is still going round and round.) That would be three servings of veg for breakfast, and four each for lunch and supper. What are they THINKing? Even I, the only client my nutritionist had ever had who wanted vegetables for breakfast, can't imagine eating that many. #5 along with an apple and a little ginger make any vegetable consumable. Another great post for me to save. I'm so glad my parents raised me to eat lots of veggies. I can't imagine life without them. I like to cut up zucchini and put it in chili. Put it in say 15 minutes before you turn the heat off. TASTY! You can also add yellow squash and corn... if you want to get CRAZY! I've also found that fresh vegetables taste better than canned/frozen and the way you prepare them makes all the difference in the world. It sounds obvious but... so many of us seem to have nightmares about eating mushy over-cooked vegetables as children. I tell you what - I can't eat enough fresh brussels! I'm all for hidden veggies. i even do that with the 16mo old - mix in green pureed veg with her carrots or yams and it's gone. feed them to her seperately? they end up everywhere BUT her stomach! one of my favs tho is to saute onion and shredded carrot until they're real soft and add to spag sauce or taco meat or chili or whatever meat base. I don't like the texture of onion, but if it's cooked enough? i don't even notice it. and the carrots.. gotta be shredded and soft-cooked. then they both add a nice flavor! still haven't tried adding cauliflower puree to mac n cheese tho. i don't see that "hiding" very well. You have given me more that enough ways to eat my veggies!!! I am pretty boring though. I microwave them & put either Mrs. Dash or mustard on them. I know, boring!!!! Yes, 11 serving of fruit AND vegetables! I love my veggies, but 11 servings alone would be a bit much. I think some of my weight loss this summer is partially due to an intense love of fresh asparagus (steamed or roasted, it is delicious and extremely filling). That and raiding the farmer's market every other week. My favorite combo is red bell pepper, zucchini, tomato and garlic sauteed in olive oil with some pepper, thyme and rosemary. Delicious! The best veggie snack is baby carrots and veggie cream cheese. Or sugar snap peas. Eating celery raw is just... bleh... and not filled with much nutrition. Give me a raw carrot any day! For many dishes I love the "trinity" of celery, bell pepper and onion (plus garlic, of course). Just about everything I cook starts with it chopped and sauteed in olive oil until soft, which adds a bunch of flavor and vegetables. There truly is no better way to eat veggies than to blend them--especially if you hate them. I've just recently started using Minneola Tangelo oranges (because they are strong in flavor) to mask the vegetable flavors that I don't enjoy and it tastes like I'm drinking Tang. You can hardly tell the green smoothie is super healthy and packed with nutrients. there is fully nothing as refreshing as all-natural veggies that you recognize, exactly and specifically wherever they arrived from, just because they are from your own garden.House grownup veggies area unit far more refreshing and moneyed in vitamins compared to people who originate from huge farms.